we joke about how the Mackie 1202 is a standard issue garage band audio mixer. it seems like everyone we know has used one. it’s a little mixer but it’s every bit as useful as something much larger. you may eventually out grow it replacing it with something that has FireWire or has more channels. but chances are you will hang on to your 1202 long after you’ve upgraded to something else. the 1202 gets it’s name from the total number of it’s inputs and outputs. which is 12 inputs and 2 outputs. this breaks down to 4 mic/line inputs and 4 stereo line inputs. this adds up to 12 because you count the stereo lines as 8 not 4 even though it’s only got controls for 4. there’s marketing for you. it’s small. like 12″ by 12″ small. meaning you can put it in a backpack, briefcase, or rolling suitcase for traveling to locations. and because it’s small it won’t look like you are moving in when you get there. the small is also good because you can mount it in a rack using the ears made for the job (ears sold separately). the 1202 behaves like a big mixer. it uses high-quality preamps like more expensive mixers. if you look at the graph for the preamps you’ll see that they are indeed impressive. keep in mind that it’s very hard to hear the difference between these things. but some people can. every mic input has an insert. this allows you to “insert” an effect or audio processor immediately after the preamp. just about anything can go here including a compressor/limiter, EQ, echo/reverb or something weird like a guitar pedal. the very same things that don’t make sense on your 1202 will also not make sense on a larger board. just the same, once you understand how to hook things every mixer will work like that. you will find that the 1202 has enough features to learn the ropes that will help you around any other mixer. as simple and small as the 1202 is you will find it works well for small live set-ups. it’s also great for a submixer for a keyboard player. you could also use it as an auxiliary mixer. 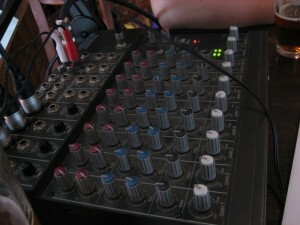 for example mixing four mics on stage and sending the output to the main mix. we’ve used a 1202 to bring CD, DVD, BetaCam and other audio sources into a computer which allowed us to fix levels as it was being captured. here’s the thing to remember: a bigger board isn’t necessarily a better board. sure, it looks impressive but will it really help you? usually the answer is no. other mixers in this category may have more bells and whistles. and you may actually need some of those features like faders instead of knobs, EQ with sweepable mids, more bands of EQ, more inputs, more outputs. just don’t let a need to fuel an ego cloud your decision. also remember that Mackie isn’ the only game in town. we’ve used all of these boards at some point. as you shop you will find all different sizes of mixers. there’s a board that has just 1 mic input which might be perfect if you monolog. for not much more money you can get two mic inputs which is potentially more useful. the 802-VLZ3 is a single AUX send making it useful for Skype/Phone patching. one thing that is consistent is the smaller the board the fewer features it has. there isn’t much risk in buying used audio gear. mixers, microphones and effects pretty much work like they work their entire life. while most gear holds it’s value nobody is going to pay nearly what it’s costs for new. if you bought something used and outgrow it or need something different you can resell it for no loss compared to selling new-ish gear. your $100 purchase won’t lose that value even if you use it for a year. look for deals on eBay, craigslist or local musician hang out. please keep in mind what a brand new mixer costs. since the 1202 shipped in the early 90’s there have been 4 revisions of the board. 1202-VLZ Pro – improved the Mic Preamps. added the word Pro. 1202-VLZ3 – improved Pres. removes the head phone volume knob. mix-minus for Skype patching. feed the Skype caller into the board so everyone can hear but mix out their voice so they can hear everyone with the echo of their voice. use inserts to patch in other processors or pre-amp’d mics. a processor could be an EQ, Compressor or Voice Processor. the MUTE button allows you to have your caller ready and listening without having them in the conversation. look, as much as we love our 1202’s it’s not the best mixer in the world. but then what mixer is the best? every thing we’ve considered has some fatal flaw. like no Inserts, only one AUX bus or all the knobs are the same color. it’s the little things. some people would say that the 1202’s flaw is that it uses knobs instead of faders making it harder to see where the levels are. I know I’ve wished for a MID EQ knob. you may find that you need features found on a bigger board. in talking with people about this project we’ve heard more than one person say, “I have one of those. I’m never going to give it up.” same here. we think it’s pretty awesome for what it does. our 1202 is 15 years old. it’s still in service. here’s some graphs that tell you a story about head room. Note that your link for the ‘guide for hooking stuff up’ is missing the ‘h’ in ‘http’. Keep up the great work! fixed the missing H problem.